At Intersound we have Acoustic guitars to suit players of all abilities, whatever your budget. Whether you’re looking for a nylon strung classical for a novice (including ½ and ¾ size guitars for children) or a steel strung acoustic (with or without electrics) with nearly 150 acoustics in stock and ready to play, you’ll be sure to find a guitar that’s right for you. 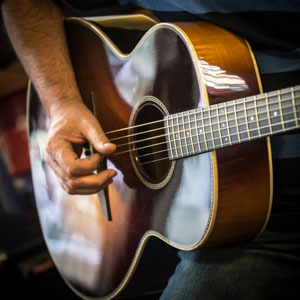 For the experienced player we have some of the finest hand-built acoustic guitars from top luthiers including Brook, Fursh, Lakewood, Steve Toon, Alistar Atkin and more. Even our ‘starter’ guitars are high quality instruments and unlike the catalogue stores and charity shops, all our guitars are professionally setup before leaving the store. We don’t believe in the ‘hard sell’ – You’re welcome to visit any time and stay as long as you like to try a range of guitars and find the one that’s right for you.